In this post, one property of similar objects. In the previous article, we have discussed that if we want to preserve the appearance of our picture or object (that is without being stretched), we will have to enlarge or reduce it with the same proportion. That means that if we double the width of our picture, then we will also have to double the length. 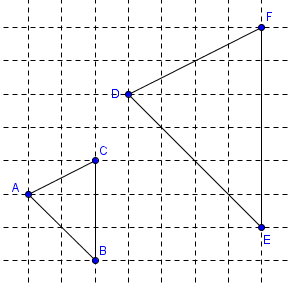 We have done this using the two triangles as shown below. We made sure that if we pair the sides of the two triangles, in each pair, the length of the side of the larger triangle is always twice the length of its pair. This means that the length of DF is twice the length AC, the length of DE is twice AB, and the length of EF is twice the length of BC. In layman’s language, we say that two objects are similar if, in some way, they share certain characteristics. For example, we can say that two flowers are similar if they have the same number of petals and they have the same color, although, they might be different flowers. Are Buu and Patrick similar? Now what does that exactly mean? Similarity is an enlargement or reduction of objects. A picture, for instance, may be enlarged or reduced in two ways. One way is stretching/shrinking it in proportion, and the other stretching/shrinking it horizontally or vertically. When we say enlargement/reduction by proportion, we mean that if we want to increase/decrease the length by any percentage, we also increase/decrease the width by a similar percentage. We can easily see that enlargement/reduction of pictures not in disproportion as shown below gives us a somewhat stretched picture. The second and the third picture in the first figure below are stretched horizontally and vertically, respectively. This means that if we want to preserve the appearance of our picture, we must enlarge or reduce it in proportion. The second figure is the proportional enlargement of the original photo.